The Myriad LM ushers in a new generation of digital meters. From the ¼ Din 4" X 4" housing with fully removable P.C. 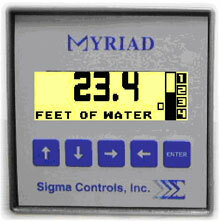 board, to the 128 x 32 pixel bitmapped LCD display and simple user set up, the Myriad LM offers unmatched versatility in level monitoring. The unit accepts a standard analog input signal and offers isolated retransmission of signal. Digital outputs may be configured for control or alarms and are front panel settable.